Ahh, Walt Disney World. You know, it doesn’t matter how many times we’ve been or how old we get — we’re always so excited about going back. A long, long time ago, we were amazed to find that there are people out there who are certifiable Disney freaks, who literally dream of the Magic Kingdom, spend excessive amounts of time planning itineraries, and actually cry when they have to leave the magic behind. And now? We count ourselves among their ranks. I say that all with complete sincerity. But I tell you, we almost nullified all the magic this time by making a tragic choice the morning of our flight. We left the strollers in Texas. The girls woke up with such energy and gusto that we were certain they would be sprinting through all four parks, so we made the decision to save ourselves the trouble and rejoiced that finally, we had children old enough to hike the World along with us like the troopers we know they are. And they were such troopers. They both shot up out of bed at 3am that morning, with plenty of enthusiasm. Ana was even more enthusiastic because it was her birthday, and she made it her goal to tell every person we saw ALL DAY LONG that she was now seven years old. It was a big deal, y’all. 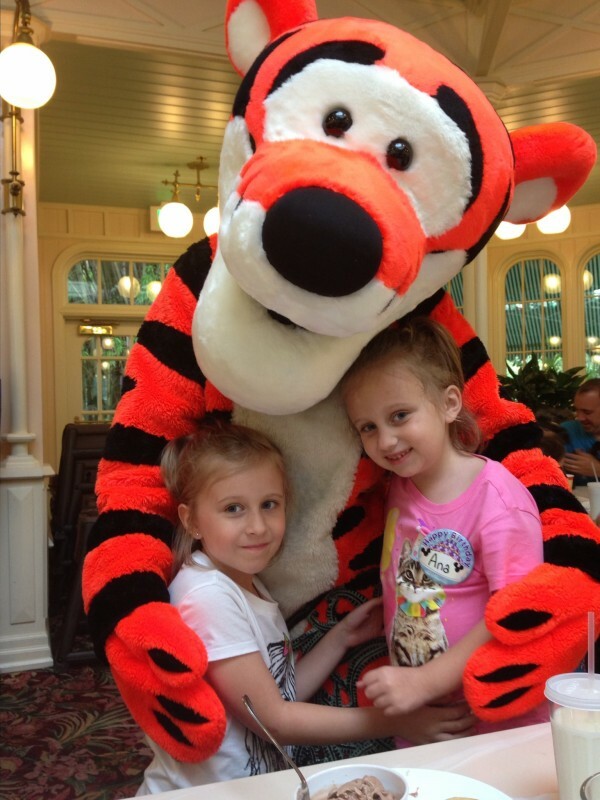 We had an easy trip to Orlando, a quick jaunt over to WDW on the Magical Express, and a great check-in at Port Orleans Riverside, where we were told that our room had been upgraded to a princess room at no charge. This was super exciting news for the girls, who spent more than a few minutes screeching about the princess fabulousness of our new digs before we convinced them to go to the food court for a quick lunch before heading to the parks. When we booked this trip, Wes and I did the math and realized that with this trip, our trip in November (gifted to us by his parents), and our marathon weekend in January, we would actually end up saving money by buying annual passes rather than getting tickets for each trip. Yes, really. So, twist my arm and “force” me into potentially squeezing a few more Disney days out of the year because, hey, I have the long coveted annual pass, right? Exactly. Because this was our first time to use the passes, we had to actually GET the passes at guest services. We marched ourselves up to the window right outside the Magic Kingdom with all the confidence of people who were about to be granted the keys to the kingdom (literally)… and were told that we needed photo IDs. Which we didn’t have on us. Because without strollers? We were traveling light. Of course. So, back to the buses we headed, and as soon as we stepped onboard, it began pouring rain. I mean, like, look around outside to see if there’s an ark floating by pouring rain. Our first day wasn’t looking so sunny and bright. Logic would have told us to take a rest. To buy strollers at the gift shop. Or just to call it all a loss. But Wes has more Disney faith than I do, and he got us all back on the bus to the Magic Kingdom, marched us up to guest services, and got our passes. The system managed to break down in the middle of all of that, which meant that we stood at Guest Services for about thirty minutes longer than we normally would have. Just great prep for the lines inside the park, y’all, and I used the opportunity for a rousing game of “Mommy Says,” which is always a crowd favorite with the Faulkettes. And with random strangers’ children who always seem to join along in our games in long Disney lines. Disney should pay me for my trouble, y’all. I will accept payment in the form of Mickey Bars and/or Fast Passes. Finally, we were through the gates, with Ana already lagging behind, pushing towards Cinderella Castle with mouse ears on! From there, we attacked Fantasyland. We attacked New Fantasyland. We attacked Adventureland. We attacked Frontierland. We attacked Storybook Circus. After dinner (where Ana was insistent on meeting every person who had a birthday button on like her, most of whom were men in their twenties — oh, Ana), Wes’s skills got us on both Splash Mountain and Big Thunder Mountain, two rides that Ana had never ridden before. She loved Splash Mountain, as we predicted she would, but halfway through Big Thunder, she yelled, “This is HORRIFYING!” Ahh, Ana. Ever the wordsmith and linguist, even when she’s scared witless. We stayed up and at the parks much later than we should have, finishing out the night with a bit of the Main Street Electrical Parade. Even in their exhausted stupor, the girls were still intrigued. Ana proclaimed, even as we were walking out the gates and down to the buses, that this had been the best birthday ever. 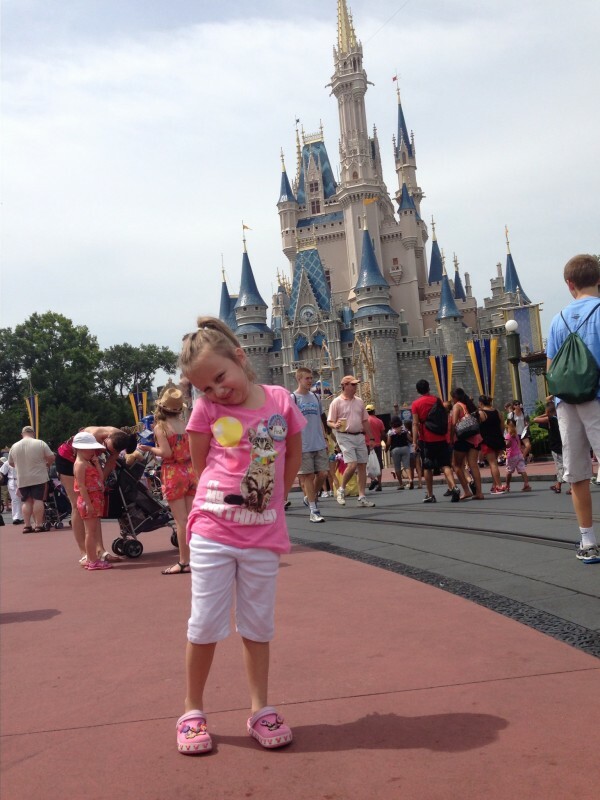 And enjoying the day with her, seeing her smiles and hearing her giggles on all of her favorite rides? Made it pretty amazing for us as well.